Pretty Soggy Today, Pretty Snowy Later…! Tuesday….Nov. 29, 2011……What a heavy rain event, most areas in the mtns got 2-3″ minimum and some areas 4-5″. And today round two is a snow event, an upper level low out of the Ohio River Valley will bring the first real snow event of the season thus far….real in that there will be significant accumulations….. accumulations of dusting to 1″ at 2000ft, 1″ or more at 3000′. and up to 3″ of snow at elevations of 4500 ft and higher and maybe isolated higher amounts on west facing slopes…Yes! Snow, time to go fishing! New R, South Fork 310/4930 cfs, South Toe River 110/1090cfs (had been 3000+), Davidson River 90/1000 cfs (had been almost 3000+), Jacob’s Fork Catawba R. 31/370cfs (had been nearly 600), Mitchell River 98/513cfs (still rising/raining), Linville River 101/3690cfs (was up to 5000+), Mills R. 123/1360cfs (was up to 2200cfs)………………………..Again…..Fishing is going to be great after this rain….! 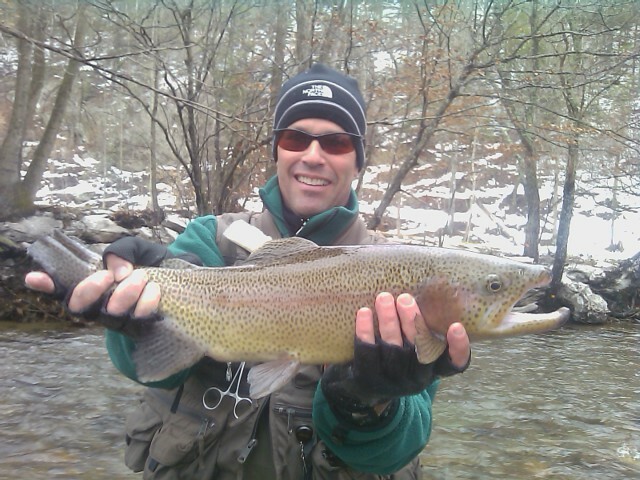 Client Bob Stanford with a huge rainbow caught on a winter trip with me....see, proves yet again for the upteenth time that snow and cold are big fish time..! Mon…Nov. 28, 2011….The rest of the fishing day on Saturday was fantastic, was guiding Dr. Jim Kramer, and we ended up with over 70 fish caught and one citation rainbow that was 22-23"…..and we fished nymphs, streamers, and dries and caught fish all ways. We finished up fishing dry flies to rising fish which was a treat and a good exclamation point. Spent the rest of the weekend time with my family and Sunday afternoon we picked up our Christmas tree in Roaring Gap, NC. Wow, doesn’t seem like it should be that time of the year already. One thing is for sure though……its going to feel like Christmas and in the high country its going to look and feel like it as the mtns are going to get a dusting to 3 inches of snow depending upon elevation. The other part of this weather event is the 2-3in rains that are occuring now in the mtns. Might color things and make for some difficult fishing conditions the next few days. But we need the rain and look forward to fishing afterward. Have a busy week coming up, have a couple NC trips then a back to back S. Holston/Watauga overnight. And ultimately the rain is going to help the fishing a whole lot. Stay tuned as I have another killer fly assortment coming up, a Tailwaters Kit which will include flies that work on the South Holston, Watauga, Clinch, Smith, and Jackson Rivers as well as all other tailwaters in our region. Hope your holiday weekend was grand……and hope you have a great week. Good fishing.:.. 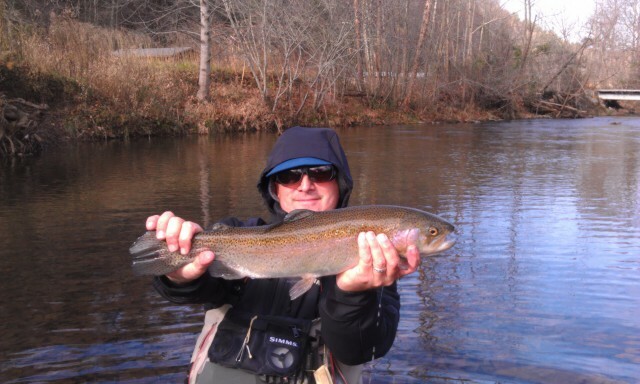 Great Fishing Under a Cloudy Sky…..
Sat…..Nov. 26, 2011…..Had a terrific day fishing and guiding Dr. Jim Kramer…caught a 22-23″ rainbow and about 60 other fish, a mix of rainbows and brookies. What a different with some clouds today, the fish were on fire. Fri…..Nov. 25, 2011………….A nice crisp, clear morning….boy can you see the stars. 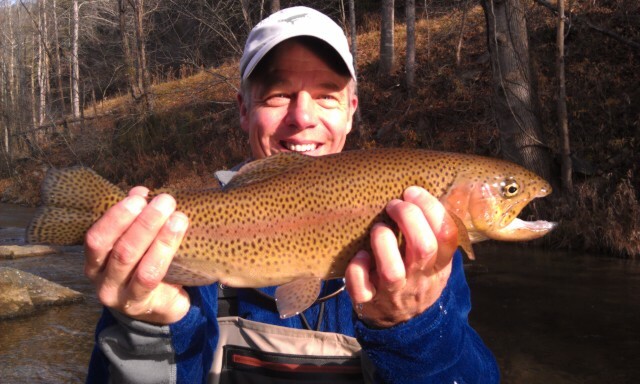 Happy Black Friday..enjoy shopping if you go, Dr. Jim Kramer and I are headed to fish a remote spot and shop for some rainbows and browns…..except there will be no long lines, no cash registers and what not. Just lots of open space, beautiful scenery, and some good fishing. I have just mailed out our new newsletter, its got a ton of stuff in it, hope you enjoy it. I sure enjoy putting it together, and what a joy it is to go through the photos of the past few weeks and pick out photos to include in the newsletter. You can view the newsletter here . We have lots of Featured Trips for 2012 and one in particular that is noteworthy, and that is our annual Wyoming backcountry trip. I have found some ways to shave off some expenses and am offering this trip at $1995.00, which is $400 less than previous years’ trips. Its truly an incredible fishing trip….ask anyone who’s been…… Also coming up we have an Escatawba Trip on December 16, 2011….we have 3 slots to fill and it ought to be good as the fishing pressure on Dunlap has been light this fall and its a great chance to catch some hugenormous rainbows….is hugenormous a word? Who cares then the fish are huge? Thurs…..Nov. 24, 2011…….Frosty morning for sure, but to me it feels great. 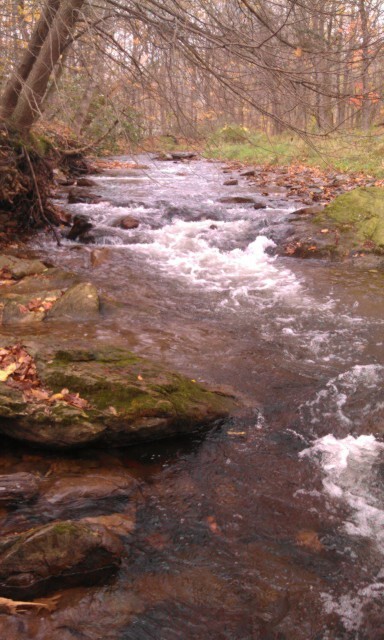 Most waters affected by rain the past day and a half should be clearing nicely and offering good fishing opportunities. Wishing you a Happy Thanksgiving…..I have a lot to be thankful for…..especially You my customers….! Will be preparing for a two day trip with Dr. Jim Kramer. We will be fishing some pretty remote water and hopefully putting a few good ones in the net. 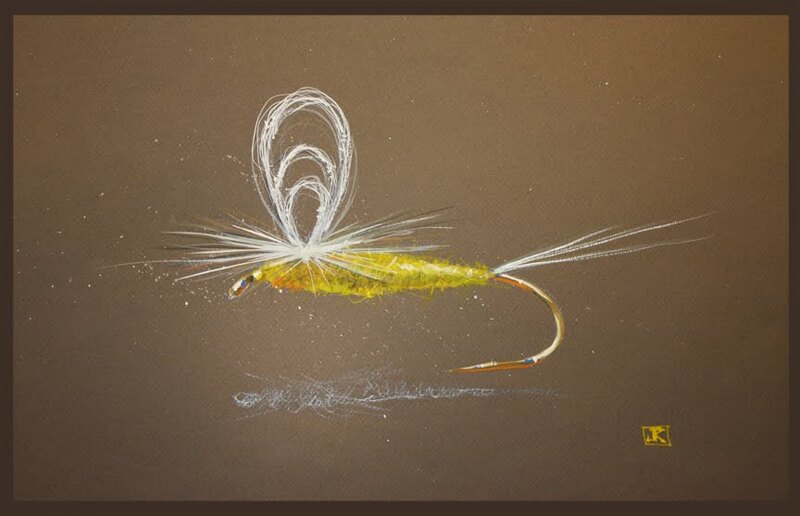 With the mild weather try fishing some caddis dries or blue winged olive dries….I have personally encountered a lot of the latter everywhere I have fished. 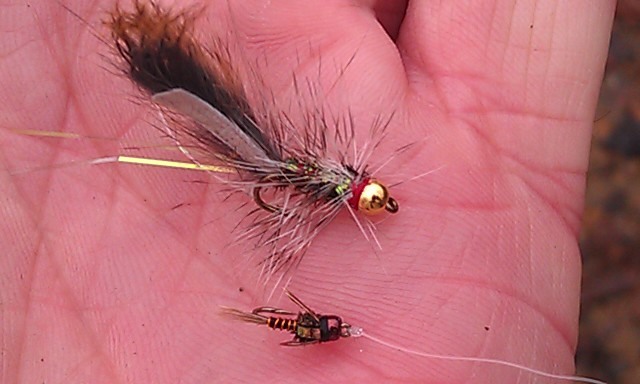 And the little size 18 and 20 black winter stoneflies aren’t far off…. Great Day of Fishing Yesterday……. 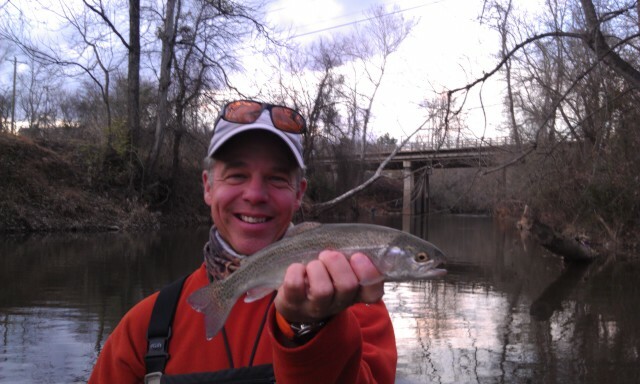 Had a trip planned today with Mike Workman, Thomasville, NC, a friend and regular client of mine, we had planned to go chasing some of the giant 10lb plus private water rainbows on some leased water that I have access to…. but the heavy rains that passed through with the front that moved across our area last night resulted in some high water conditions and muddy water in a lot of places. Some places might be fishable today but others are a crap shoot…… Am spending the day catching up on orders as well as some web editing and getting our updates in before the Christmas rush hits us…….. We will have more fly specials coming up……. Off to a Good Start This Week…..
Mon…..Nov. 21, 2011……We had an incredible week of fishing last week, particularly the end of the week. We caught some really nice fish, several citation fish, fished in heavy snow showers, fished to rising fish and a blue winged olive hatch, and caught some fine rainbows, browns, and brookies on NC water. That’s why this time of year is one of my favorite times of the year. I took Saturday, my birthday (not saying how old I am….) off and went fishing with one of my best friends Brad Ball. Little did we know we’d each get a 25″ fish in the first hour we fished…but that is exactly what happened. One fish hit a pink SJ and the other one of my white maggots….and both were a handful to battle and land. Have some wet weather coming in and it looks like another significant cool down. Highs in the 70s today and 40s by midweek. Fine by me, it should be cold now. Cold makes the big fish more willing to eat. I have put together a little video clip of some of the nice fish caught with customers over the past couple years…. take a look…. Also, have another special on some Micropatterns, an incredible deal....20 flies for $19.95....you get 2 each of my favorite midge patterns. You can purchase here via our online store. We are offering these deals to get folks used to using our online shop, which I will be adding a lot of stuff to in the weeks and months to come. Sat…Nov. 19, 2011…… Had a great day fishing with my best friend today, we fished in Wilkes County at a place I used to fish years ago. 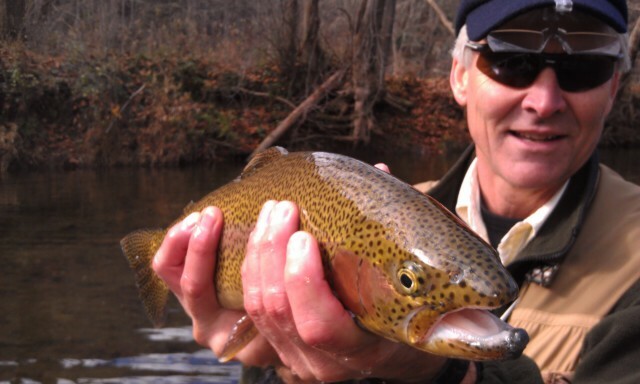 We caught two 23-25 inch rainbows and probably 60 others …..a mix of rainbows and brookies. It was a nice day, cold to start….24F and heavy frost….but it eventually warmed to the low 40s and we ended the day with a terrific blue winged olive hatch and caught the last 25 fish on dry flies. It was really an incredible day. Will be getting ready for a week full of trips coming up……have a great weekend…..! Great Day, Good End to a Great Week…. Fri….Nov. 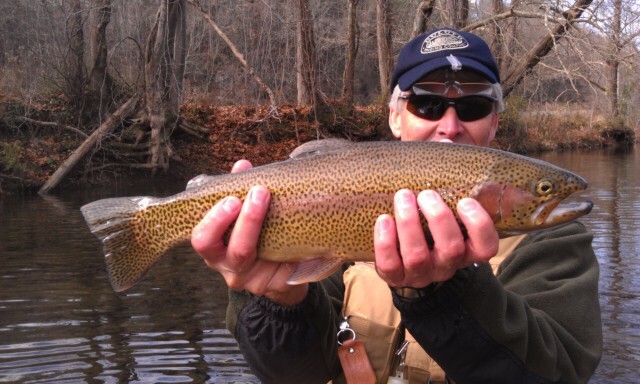 18, 2011….After a first half of the week off, we had two good days, yesterday with Jeff Chalmers catching some huge Escatawba Dunlap Creek rainbows up to 23"….and it was cold….and we fished the second half of the day in heavy snow showers. When we left the ground was white…its mid November, right..? 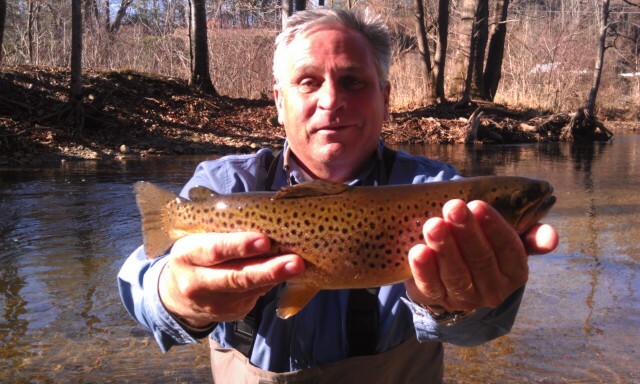 Had another great day today here in our mtns with client Mike Riley of Raleigh, NC, and we landed 35 fish including one brown that was just shy of 20". It was fun. 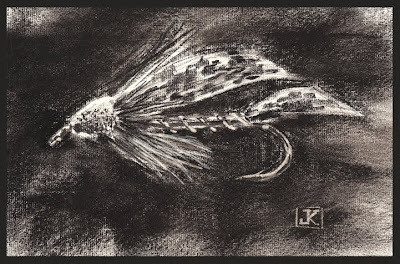 Both days were caught fish nymphing….and the past few days dead drift nymphing with a wooly dropper has been deadly. I am using one of my new hybrid Buggers called a dead squirrel…it kills ’em….